It's nice to have a dedicated space in which to record your podcast. Still, there are times when you need to travel or otherwise record outside of where you normally do. The Zoom H4N is a nice and reasonably-priced piece of gear, but even it may be overkill for a podcaster who doesn't record away from the studio much or has very simple recording needs. If you're one of those podcasters, you may want to consider using your smartphone as your mobile recording device. The GLS ES-58 is a copy of the classic Shure SM58 microphone, which you'll find in almost every music venue, comedy club, or church. The GLS ES-58 has all-metal construction and is a solid microphone for about 1/3 the price of the Shure. 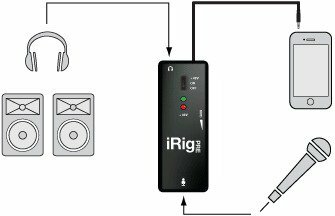 Its unidirectional pickup pattern (it's most sensitive to sound arriving from directly in front and less sensitive in other directions) makes it a great option for less than ideal recording environments, such as noisy conferences or other places you may find yourself recording. This is the piece of gear that allows you to plug a microphone into your mobile phone. You can get the analog version (pictured below) for around $40 or a digital version for about $100, depending on the type of phone you have. If your phone has a 1/8" headphone jack or you have a 1/8" adapter, the analog is fine. If you have a newer model iPhone or another phone without a 1/8" headphone jack, the digital version may be a better option for you. It's a simple setup. 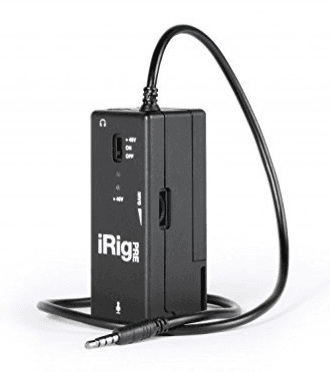 Plug the mic in one end of the iRig Pre and your phone in the other. Use headphones if you want to monitor what the mic is picking up. Backpack Studio (formerly known as Bossjock) is an all-in-one iPhone app that allows you to record, mix, and upload audio files with ease. For Android users, I recommend Auphonic Edit, a free app from the makers of Auphonic. It's nice to have options when recording. It's also nice to have recording equipment on hand when traveling as you never know who you're going to meet or what situations you'll encounter. If you know you'll be recording with multiple people, the Zoom H4N or Zoom H6 are probably better options for you, as they'll allow you to connect multiple microphones and record each on its own track. If you're a solo podcaster or can get your needs met with a single microphone and single track, it's hard to beat the ease and price of recording to your smartphone.